The president is doing his country’s economy good even as his popularity craters over graft charges. A less nationalist energy policy paved the way for a record haul in a drilling-rights auction and bodes well for more. It may leave Mexico and its oil deals battling for bids. 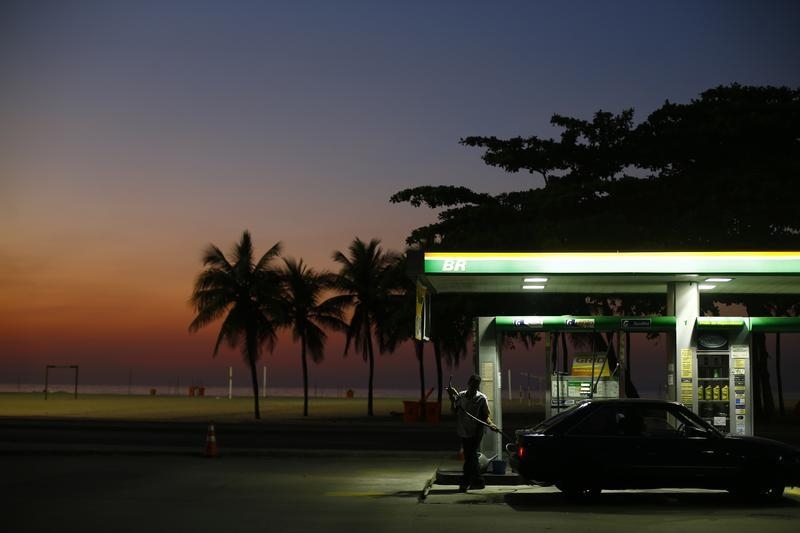 A worker prepares to fill a car at a gas station close to Copacabana beach in Rio de Janeiro, January 12, 2015. Exxon Mobil won 10 exploration blocks in Brazil's latest round of bidding for oil drilling and production rights held on Sept. 27, including six in the offshore Campos basin in association with state-controlled oil giant Petroleo Brasileiro. The basin lies adjacent to Brazil's coveted "pré-sal" or subsalt area where hydrocarbons are trapped under a layer of salt beneath the ocean floor. Brazil will hold auctions for exploration and production rights in the subsalt area on Oct. 27. Brazil garnered a record 3.8 billion reais ($1.2 billion) from the auction round, in which it sold 37 of the 287 onshore and offshore blocks on offer. It had expected to raise around half that amount had it placed all 287 blocks. The last such auction round, in December 2015, raised just 121 million reais. Other successful bidders on Sept. 27 included China's CNOOC and Repsol of Spain. Mexico plans to hold its next round of auctions for deepwater oil and gas areas in the Gulf of Mexico on Jan. 31, 2018. Brazilian President Michel Temer's approval rating has sunk further since new corruption charges were brought against him, and 92 percent of Brazilians do not trust him, according to a new poll published on Sept. 28. Pollster Ibope said the number of people who consider Temer's government "bad" or "terrible" rose to 77 percent from 70 percent in July.